Etihad flight bookings qualify to participate in our exclusive travel vouchers for reviews program. Simply email a writeup of your flight to cheapflights@southafrica.to then we will send you SouthAfrica.TO flight discount vouchers. 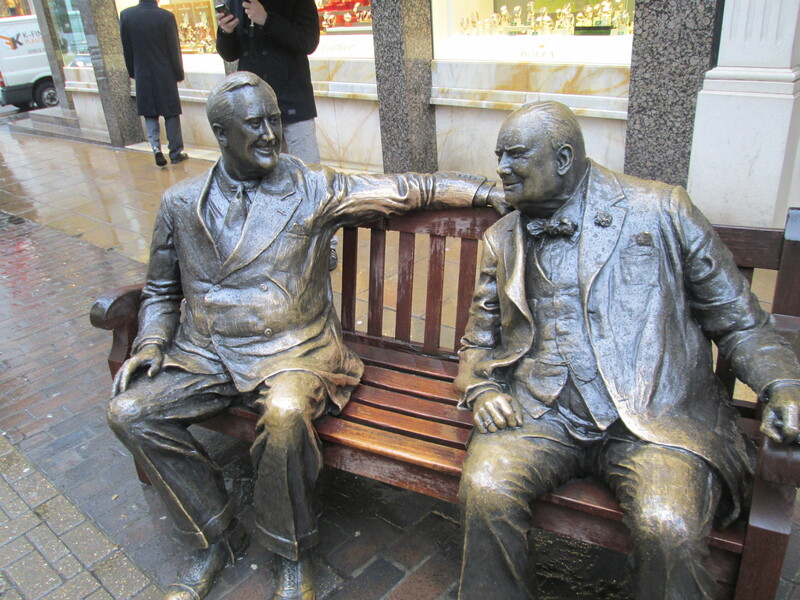 Help with Flight Quotes - SouthAfrica.TO's travel consultants are itching to help you! Book cheap Etihad flights by using the search engine on the left. Etihad Airways is the flag carrier of the UAE and offers flights from Johannesburg to Abu Dhabi and beyond. Etihad Airways (EY) is based in Abu Dhabi, United Arab Emirates, and owned by the Abu Dhabi government. With a generous two pieces at 23kg each baggage allowance in economy class and in-seat power sockets, Etihad is a popular option for those with lots of luggage and who want to keep their electronic gadgets powered (not to mention that they frequently offer the cheapest flights). Only founded in 2003, they have grown quickly to become the second largest airline in the UAE (Emirates takes first placce) and was voted the "World's Leading Airline". Find more information on Etihad Airways below. 28 August 2017: Etihad Airways has amended their free chauffeur services as offered to premium guests, as they can now only make use of the service for free in Abu Dhabi. The previously complimentary service will now be offered to guests at a specially negotiated rate and will no longer be exclusive to premium guests. Passengers travelling in The Residency in an A380 from Abu Dhabi, London, Paris, Sydney and New York will still be able to make use of this service at no additional cost. Passengers travelling on First and Business-class tickets issued before the 3rd of July can still make use of the complimentary chauffeur service. 4 July 2017: Etihad Airlines proudly announced that they are once again allowed to transport electronic devices in their cabins on flights to the US. This has largely been attributed to additional security checks at the airport. Passengers wanting to take their electronics devices on-board with them have to pass through the US Immigration and Customs at the US Preclearance facility in Terminal 3 at Abu Dhabi International Airport. The US introduced an electronics-ban in March 2017 on all flights originating in the Middle-East. It has affected airlines like Emirates, Qatar and Turkish Airlines as well as Etihad until recently. 18 October 2016: Etihad Airways is introducing their latest two-class Dreamliner on their Joburg route this November! From 1 November 2016 you'll find yourself in their latest aircraft when travelling between Abu Dhabi and Johannesburg. Unfortunately this version does not include the first class apartments, but does feature new economy class seats that provide lumbar support as well as luxury lie-flat business class seats. You can also expect to find the flying nannies on board as well as top notch entertainment. 14 October 2016: Etihad Airways has become the first UAE airline to be awarded Skytrax 5 Star rating yesterday. The airline beat Emirates and joined the ranks of ANA All Nippon Airways, Asiana Airlines, Cathay Pacific Airways, Eva Air, Garuda Indonesia, Hainan Airlines, Qatar Airways and Singapore Airlines. Skytrax’s chief executive Edward Plaisted said, "Of particular note is Etihad’s attention to detail and a meticulous approach to design, which has brought us – among other unique products – the airline’s revolutionary Airbus A380 and Boeing 787 cabins, which are clearly best in class." Judging from our airline reviews, the rating is justified! 4 April 2016: Etihad Airways are adding three additional flights per week to their Abu Dhabi - Joburg schedule this July to September. "These additional flights offer greater flexibility for the large numbers of guests travelling between the UAE and the GCC region, and South Africa over the summer period," said John Friel, Etihad Airways' General Manager, South Africa. "They also provide our guests travelling from South Africa with greater access to a large number of popular holiday destinations across our global network, in Asia, the Indian Sub-continent, Australia and the USA." The additional flights will fill the gap left by SAA when they cancelled their agreement with Etihad Airways and stopped operating flights from Johannesburg to Abu Dhabi. 10 June 2015: Etihad Airways has started operating a daily return flight to Edinburgh. This is Etihad’s first route to any Scottish destination. The inaugural flight left Abu Dhabi for Edinburgh at 02h20 on the 9th of June 2015. The airline will use an Airbus A330-200 to service this route. There are 22 business class seats and 240 economy class seats available on this flight. 23 Feb 2015: Etihad Airways has appointed a new General Manager in South Africa. John Friel is no stranger to Etihad or South Africa for that matter despite the fact that he was born in Switzerland. He has been Regional Business Development Manager in South Africa since 2014, with nearly 14 year's experience in the airline industry. We hope that he will further strengthen South Africa's ties with Etihad airlines and promote possible Cape Town and Durban routes - which is something we have been waiting for for far too long! Infants can take one bag weighing up to 23kg. This new baggage policy applies to all Etihad tickets issued after the 14th of September 2015. This information was correct at the time of writing, but it could have changed since then. A different policy might apply, depending on where you are travelling from. Please make sure that you are aware of which policy applies to you here. Following the recent launch of their new livery, Etihad is supgrading its in-flight offering and it is not restricted to premium classes! Not only will first and business classes now be dining out of new designer crockery but economy class will be treated to a new specially designed pillow which can double as a neck pillow, a new eye mask that indicates whether you want to be woken for food services and finally a cabin refresh. Etihad Airways continues to keep passengers' comfort in mind which will surely guarantee them a few more rewards for the mantel! On the 1st September 2013 Etihad introduced their "Flying Nanny", who is available on all of their long haul international flights. The flying nanny is a member of the Etihad cabin crew who has been especially trained (at Norland College) to help families travelling with kids. The flying nanny wears an orange apron so that passengers can easily identify them. She'll help pax with kids from the boarding gate, help on board with setting up the bassinets, take care of minors who are travelling unaccompanied and ensure children are entertained whilst you sleep. Etihad Airlines only operates flights from Johannesburg in South Africa to Abu Dhabi and beyond. Wherever Etihad adds flights from Abu Dhabi, this increases the 1-stop options for flights from Johannesburg to that destination via Abu Dhabi. From the 26th Oct 2014 Etihad is launching flights from Abu Dhabi to Phuket, a popular beach resort destination for South Africans in Thailand. This will enable CPT to Phuket flights (via JNB & AUH) as well as JNB to Phuket flights (via AUH). There are no direct flights from South Africa to Phuket. 1 March 2014 : Etihad may start flights to Edinburgh, Scotland, in 2015; creating a 1-stop option for flights from Johannesburg to Edinburgh (& 2-stop from Cape Town). 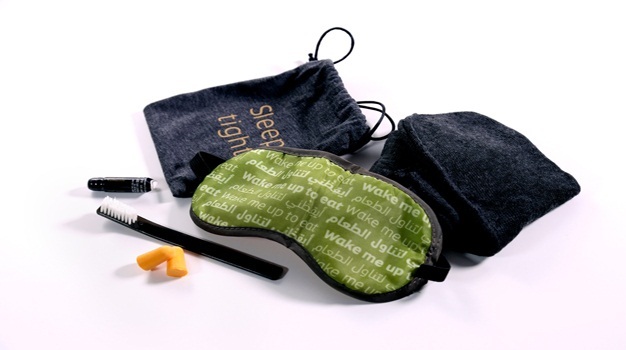 This is will add choice to the existing 1-stop options via Qatar Airways. Feb 2014 : The United States opens a border post in Abu Dhabi, its first it has opened outside the US in 20 years. This makes it dramatically more advantageous to fly to the US via Abu Dhabi, as you can bypass the queues and hassles at a US airport, by being pre-screened at Abu Dhabi. 1 June 2014 Etihad is commencing flights from Abu Dhabi to Los Angeles. This was announced on the 7th October 2013. This is the 4th Etihad flight to the United States; with New York, Washington DC & Chicago being the other destinations. 15 July 2014 : Etihad starts daily flights to Rome. 2 July 2014 : Etihad launches 4 flights a week to Yerevan. 1 June 2014 : Etihad launches daily flights from Abu Dhabi to Zurich, creating 1-stop options from Johannesburg to Zurich via Abu Dhabi; on A330-300s. Zurich becomes Etihad's 2nd Swiss destination, after Geneva. 1 April 2014 : Etihad commences daily flights to Jaipur in India. 2 Nov 2013. Etihad has suspended its thrice-weekly flights to Tripoli, because of concerns about safety at Tripoli Airport: “As the safety and security of our guests, employees and assets remains our number one priority, our assessment of the existing situation at Tripoli airport does not provide the level of assurance we require to ensure safe operation of our flights. Once we are satisfied that the arrangements at Tripoli airport meet our requirements, we will resume services." said Etihad's COO, Richard Hill. 17 Jan 2012. Etihad launches flights to Tripoli, Libya. May 2015. Etihad Airways now flies directly to Madrid, Spain. Oct 2013. 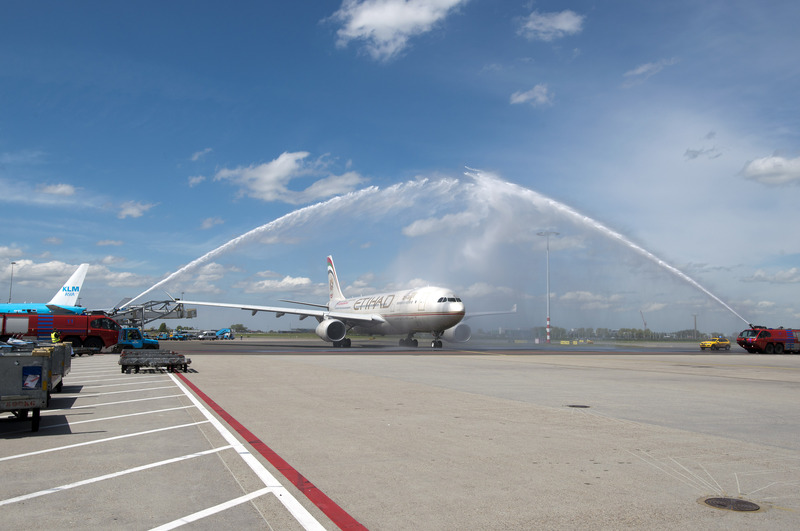 Etihad starts flying to Ho Chi Minh City. 1 Sep 2013. Etihad launches flights to Sana'a in Yemen. "The launch of direct services to Sana'a is consistent with our strategy of adding depth and scale to our network and targeting areas of growth in emerging markets. The ancestral, cultural and business ties between the two countries are significant, and we believe the new service will further facilitate Yemen's economic development in the months and years ahead." said Etihad's CEO, James Hogan. 1 Aug 2013. Having just launched the route on the 1st June, Etihad will be increasing its frequency of AUH - SAo Paulo flights to a daily service from 1 August 2013. This creates more opportunities for 1-stop flights from Johannesburg to Sao Paulo via Abu Dhabi. 1 Jun 2013. Etihad launches flights to Sao Paulo, with its inaugural flight in an Airbus A340-500 plane landing at 16h35 (Sao Paulo time). 15 Jul 2013. Etihad launches a second daily flight from Abu Dhabi to Kuala Lumpur - both flights are in Airbus A330-200s, thus creating more 1-stop flight options from Johannesburg to Kuala Lumpur via Abu Dhabi. 30 Jun 2013. Etihad switches to a Boeing 777-300ER on its Abu Dhabi to Dublin route, which can carry 34% more passengers. This create more capacity for Johannesburg to Dublin flights. Dublin flights have become particularly important since the Aer Lingus codeshare created onward flights from Dublin. 1 Jun 2013. Etihad increases its frequency of flights to Beirut to 19 a week. 1 Jun 2013. Larnaca flight frequency is increased to 4 flights a week. 15 May 2013. Etihad launches daily flights to Amsterdam. This allows 1-stop flights from Johannesburg to Amsterdam, via Abu Dhabi. 2 Apr 2013. Tokyo flight frequency increases to daily. 1 Apr 2013. Flight frequency to Islamabad is increased to 11 a week. 31 Mar 2013. Abu Dhabi to Lagos flight frequency is increased to daily. 31 Mar 2013. Etihad commences flights to Washington. 28 Mar 2013. Frequency of Abu Dhabi to Casablanca flights are increased to daily. 2 Nov 2012. Flights to Addis Ababa were meant to be launched on the 2nd November, but the Ethiopian CAA denied Etihad's application for an operating permit, forcing the airline to postpone the launch. “The actions of the Ethiopian CAA ignore the Memorandum of Understanding between Abu Dhabi and Ethiopia. They are also very much against the best interests of consumers, who are being denied the opportunity to experience Etihad Airways’ service. We will continue to push for terms of the MoU to be honoured. In the meantime, we deeply regret any inconvenience caused to our customers and business partners by this delay,” Etihad said in a statement. 1 Nov 2012. Etihad Airways commences flights to Ahmedabad. 1 Oct 2012. Flights to Vietnam, Ho Chi Minh City, commence. 1 Jun 2012. Etihad Airline starts flying to Sao Paulo in Brazil. 31 Mar 2012. Flights to Washington DC are launched. 26 Aug 2012. In partnership with Alitalia, Etihad begins flying direct from Abu Dhabi to Rome. 1 Jun 2012. Etihad commences flights to São Paulo. 24 Jan 2012. Etihad Airways discontinues its Cape Town - Johannesburg. At the same time the airline continues to provide its 7 times per week service between Abu Dhabi & Johannesburg, but at revised times on certain days of the week. Etihad Airways has put in place a number of options for re-accommodation of guests affected by the discontinuation of service as well as the re-timing of the Johannesburg service. Guests currently holding reservations to Cape Town will be rebooked onto an Etihad flight between Abu Dhabi & Johannesburg. Accept the rebooking to/from Johannesburg. Tickets should be reissued within 30 days of the notification of schedule change. Fare difference or change of reservation fees will be waived. For guests travelling to/from Cape Town only, accept the rebooking to/from Johannesburg & add flights between Johannesburg & Cape Town using local services. Rebooking & ticketing should be completed within 30 days of the original notification of schedule change. Fare difference or change of reservation fees will be waived. Booking class to be used on local services between Johannesburg & Cape Town is detailed in the table below. Change the Etihad provided re-accommodation to a new date within 7 days of the original flight date. Rebooking should be in the original RBD on Etihad Airways or the lowest available RBD within the ticketed cabin. Rebooking and re-ticketing should be completed within 30 days of the original notification of schedule change. Fare difference or change of reservation fees will be waived. For rebooking and ticketing not completed within 30 days of original schedule change notification the guest can be rebooked & ticketed at any new applicable fare. Accept the rebooking to/from Johannesburg. Tickets purchased and issued within 30 days of the notification of schedule change will be at the original fare. For guests travelling to/from Cape Town only, accept the rebooking to/from Johannesburg & add flights between Johannesburg & Cape Town using local services. Booking class to be used on local services between Johannesburg & Cape Town is detailed in the table below. Tickets must be purchased and issued within 30 days of the original notification of schedule change at the original fare. Change the Etihad provided re-accommodation to a new date within 7 days of the original flight date. 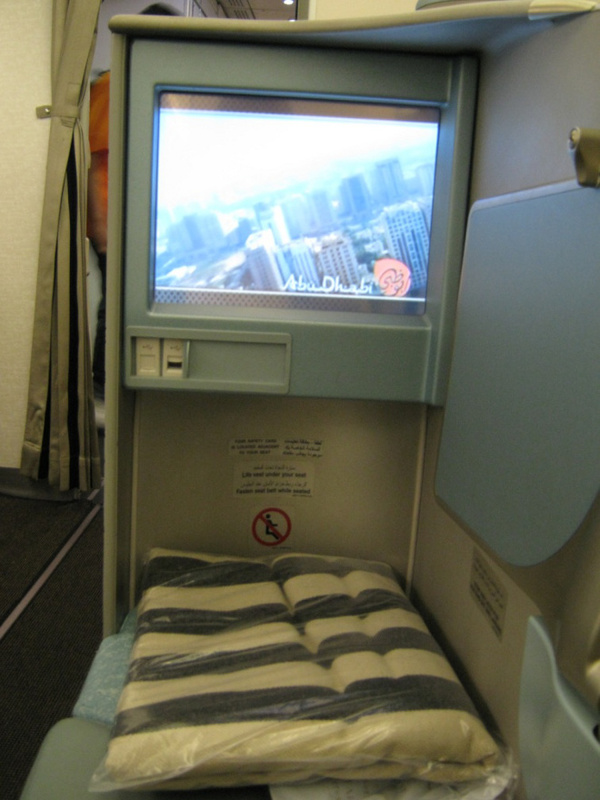 Rebooking should be in the original RBD on Etihad Airways. Tickets purchased and issued within 30 days of the notification of schedule change will be at the original fare. Rebook to any other flights or dates subject to availability at the applicable new fare for the journey. 3 times a week on Tuesdays, Thursdays and Saturdays Etihad flights are scheduled to leave Abu Dhabi at 22h10, and arrive in JNB at 04h45 the following day. 3 times a week on Wednesdays, Fridays and Sundays flights are scheduled to leave JNB at 09h15, & arrive in Abu Dhabi at 19h30. 4 times a week on Mondays, Tuesdays, Thursdays and Saturdays flights are scheduled to leave Abu Dhabi at 10h35, & arrive in JNB at 17h20. 4 times a week on Mondays, Tuesdays, Thursdays and Saturdays flights are scheduled to leave JNB at 20h30, & arrive in Abu Dhabi at 06h45. 30 Sep 2009. Etihad starts operating flights from Abu Dhabi to Cape Town, via Johannesburg. Dan Plato, Cape Town's Executive Mayor Alderman, was on the scene to welcome the inaugural Etihad flight from Abu Dhabi to Cape Town, as was Mansoor Mohamed, Executive Director for Economic, Social Development and Tourism who said: "The introduction of another airline to Cape Town means more tourists and therefore more jobs for the people of Cape Town. The City will continue to partner with airlines such as Etihad that will help build our city into a more globally competitive business and leisure destination." James Hogan, Etihad Airways chief executive, said that "South Africa is a leading global destination of choice for tourism and commerce and we are thrilled to launch a daily service to Cape Town. "In addition to the strong demand for flights from expatriate South African nationals, business and leisure travellers, many thousands of football fans are expected to travel there next year when South Africa hosts the 2010 FIFA World Cup™. The daily flights to Cape Town will operate via Etihad's current daily Airbus A330 service to Johannesburg. This service started in December 2005, and is one of the airline's most successful destinations. Dec 2005. 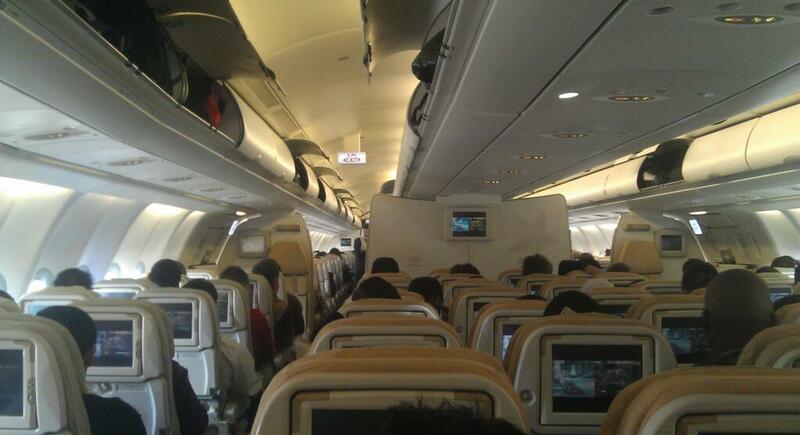 Etihad's inaugural flight between Johannesburg and Abu Dhabi. 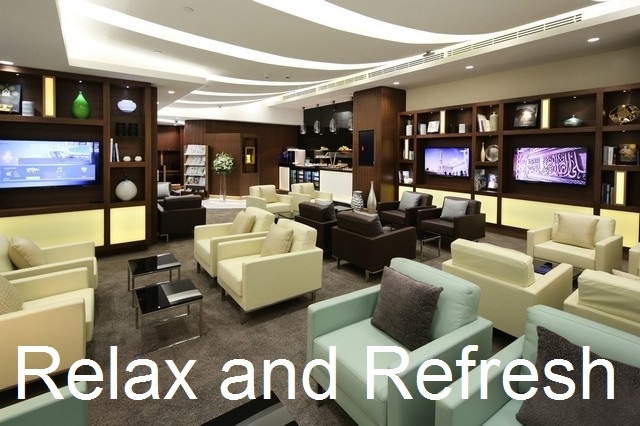 Etihad Airways introduced their first luxury arrivals and departures lounge at Abu Dhabi Airport. The lounge which features shower and barber facilities, a Business Centre and clothes steaming service will be accessible from both Terminal 1 and 3, just after customs. You can also indulge in various canapés, snacks and hot and cold beverages. Once you're ready to face the world, Etihad's Chauffeur service will be at your disposal to take you anywhere in the United Arab Emirates. This service is only available to First and Business Class ticket holders. Fully-trained barbers at SHAVE by Etihad Airways. Extra comfortable seats in the Relaxation Area. Complimentary international buffet access with delicious breakfast and snacks, cafe style. 26 Sep 2014: Last night Etihad Airways unveiled their new livery on their first A380. Inspired by the desert sands of the United Arab Emirates, the new design features a geometric pattern in golds and yellows and represents the various facets of the UAE. This new contemporary design is more in line with their new cabin interiors and lounge. It is also a better fit for a modern, 5 star airline than the somewhat dated, traditional livery they had previously. The new livery will be rolled out on their entire fleet over the next 3 years. 6 May 2014. Want a job as a cabin crew member with Etihad? They are hosting a cabin crew recruitment session in Cape Town, where prospective flight attendants can learn what working for the airline is like, as well as living in Abu Dhabi. Click here to register. As at the 23rd April 2014 there were 243 South Africans working for Etihad: 16 pilots, 120 flight attendants & 107 core staff. Etihad has a plethora of joint ventures and codeshares; it owns 40% of Air Seychelles, 24% of Jet Airways, 10% of Virgin Australia (has permission to increase to 20%), 29% of Air Berlin & 4% of Aer Lingus, 49% of JatAirways in Serbia and 33.3% of Darwin Airlines SA. Jun 2016. Etihad Airways and Avianca Airlines from Brazil have entered into a codeshare agreement. Etihad will place their EY code on domestic Avianca flights and Avianco will put their 06 code on Etihad flights from Abu Dhabi to Sao Paulo. Avianca offers Etihad passengers eight connections in Brazil, including Rio de Janeiro. Apr 2015. Etihad Airways and American Airlines are entering a codeshare agreement (subject to government approval). This will eventually allow customers to purchase a single Etihad ticket to almost anywhere in the US and check theri bags straight through. AA will place their code, AA, on Etihad services from Abu Dhabi to Paris, New York, Dublin, Frankfurtm Chicago, Milan and Manchester. Etihad will place their EY code on several internal AA flights and selected European flights. Jan 2015. Etihad Airways are expanding their codeshare with Air Serbia with two daily flights between Abu Dhabi and Belgrade. Air Serbia will now place their JU flight code on flights from between Abu Dhabi and Singapore. Jan 2015. Etihad Airways has signed a codeshare deal with Aerolineas Argentina, one of South America's leading airlines. The agreement will be effective from 1 February 2015. This will provide better connections for passengers travelling from Abu Dhabi to South America. Dec 2014. Etihad Airways signed a codeshare agreement with Hong Kong Airlines. The code share will take effect from 6 January 2015. Hong Kong Airline's code will be placed on Etihad's triple daily flights from Abu Dhabi to Bangkok and Etihad will place its code on Hong Kong's flights from Bangkok to Abu Dhabi. They will also swop codes on additional flights yet to be determined. Aug 2014. Etihad announced their 49% stake in Italian carrier, Alitalia, on the 8th of August 2014. This announcement comes after months of negotiations over exact details which have not yet been made public. Many fear mass retrenchments as Etihad aims to turn the loss-making airline into a profitable investment. March 2014. Etihad purchases more shares in Irish airline, Aer Lingus, raising its stake from 3% to 4%. The airlines already have a codeshare agreement, but the market is now wondering whether they want an even bigger relationship. Aer Lingus's other suitor is low cost carrier, Ryanair, who has recently been forced by the UK Competition Commission to sell down its stake in Aer Lingus from 30% to a maximum of 5%. 30 Mar 2013. Etihad commences a codeshare agreement with Greek airline, Aegean Airlines Aegean Airlines will launch 4 weekly flights from Athens to Abu Dhabi, which Etihad will place its EY flight code on, as well as Aegean flights from Athens to various destinations in Greece and Europe. Aegean Airlines in turn will sell Etihad flights from Abu Dhabi to 7 destinations including flights to South Africa, the Gulf and Australia. 21 Dec 2013. Etihad is reportedly considering buying up to 49% of Italian carrier, Alitalia. 1 Dec 2013. From the 16th December 2013 Etihad is commencing a codeshare arrangement with airBaltic, with airBaltic starting to fly 4 times a week from Riga to Abu Dhabi. Etihad will start selling 15 airBaltic flights into Europe." 20 Nov 2013. Etihad concludes its well-flagged purchase of 24% of Jet Airways for Rs2057 crore (Etihad & Jet signed a deal 7 months prior)". 17 Nov 2013. Etihad announces that it is buying 33.3% of Darwin Airlines SA, a Switzerland based airline, and rebranding its "Etihad Regional". 13 Sep 2013. Etihad has increased its stake in Virgin Australia from 10% to 13%, making it the 3rd biggest shareholder after Air New Zealand (23%), Singapore Airlines (20%) and the Virgin Group (12%). 1 Jul 2013. Etihad starts offering the following South African Airways flights on its system: (1) SAA flights to Cape Town from Johannesburg, (2) SAA flights to Durban from Johannesburg, (3) SAA flights to East London from Johannesburg, (4) SAA flights to Port Elizabeth from Johannesburg. The codes Etihad are using is EY6200 to EY6299 This is an implementation of the 6th May 2013 codeshare announcement. 13 Jun 2013. Alitalia & Etihad extend their codeshare, so that Etihad is now selling flights from Rome to Athens (ATH, Greece), Barcelona (BCN, Spain), Bucharest (BUH, Romania), Budapest (BUD, Hungary), Frankfurt (FRA, Germany), Geneva (GVA, Switzerland), Madrid (MAD, Spain), Malaga (AGP, Spain), Malta (MLA), Milan (MIL, Italy), Munich (MUC, Germany), Sofia (SOF, Bulgaria), Tirana (ITA, Albania), Venice (VCE, Italy), Vienna (VIE, Austria) & Zurich (ZRH, Switzerland). 6 May 2013. South African Airways & Etihad agree a codesharing agreement. 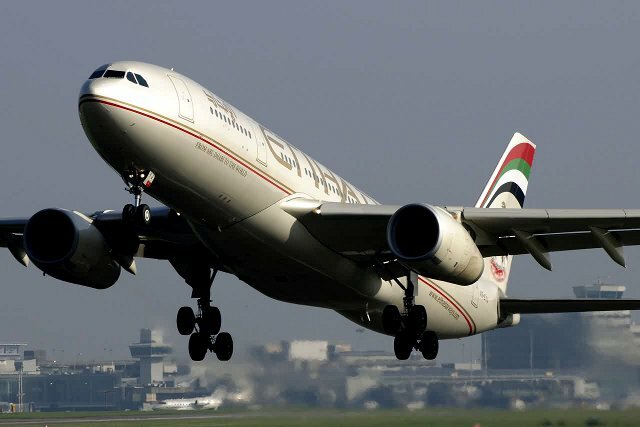 SAA will sell flights for 12 Etihad destinations from Abu Dhabi. Etihad CEO, James Hogan, said that "This strategy, of working closely with partner airlines to serve secondary cities in a market, has been highly successful for Etihad Airways around the world and we look forward to build upon our already strong relationship with the team at South African Airways to extend our footprint in the strategically critical African market". Etihad will sell SAA flights from JNB to CPT, DUR, ELS, PLZ, Livingstone Lusaka, Ndola, Harare, Vic Falls & Sao Paulo. 5 May 2013. Air France & Etihad extend their codeshare. You'll be able to book Air France flight on the Etihad site from Paris to Lisbon & Marseilles. 26 Apr 2013. Air Canada & Etihad have agreed to codeshare from the 3rd quarter of 2013, covering flights from Abu Dhabi to norther American cities served by Air Canada. 8 Apr 2013. Via a codeshare with Aer Lingus, Etihad is now offering 12 weekly flights to New York, 10 weekly flights to Boston, 8 to Chicago; all via Aer Lingus's base in Dublin. Passengers can pre-clear customs in Dublin, meaning they arrive as domestic passengers in the United States. 21 Feb 2013. Kenya Airways & Etihad sign a reciprocal codeshare agreement. Feb 2013. Etihad commences flights between Abu Dhabi and Hong Kong, in codeshare with Air Seychelles. James Hogan, CEO, said that "Hong Kong's fast growing economy and booming middle class have brought a remarkable increase in the number of travellers in recent years. "The new service connects two of the world's leading international financial and tourism centres, a move we believe will stimulate the growth of commerce and trade between the UAE and China, the UAE's second largest trading partner. With our 40% equity stake in Air Seychelles, it makes strong commercial sense for us to work together on opportunities where cooperation is possible. The resulting synergies bring about significant efficiency benefits for both Etihad Airways and Air Seychelles." 28 Nov 2012. A codeshare agreement with Garuda Indonesia comes into effect. 8 Oct 2012. Etihad has signed a codeshare agreement with Air France-KLM. Email a review of your Etihad flight to cheapflights@southafrica.to and we will send you travel vouchers (the amount depending on the length and quality of your writeup, as well as if photos were included). 2013-12-17 Diamond First Class flight from Abu Dhabi to New York on Etihad. Desert scenes. Sumptuous food. A la Carte menu. An added bonus are the views of Greenland (which the joke goes, should be called Iceland!). 30 Nov 2013. At the World Travel Awards in Doha, for the 5th year in a row, Etihad Airways has been voted the World's Leading Airline, and has also won the World's Leading Airline First Class and the World's Leading Airline Cabin Crew. 6 May 2013. Etihad is announced as being the "Middle East's Leading Airline" at the World Travel Awards 2013. 12 Dec 2012. Etihad is named the World's Leading Airline for the 4th year in a row. “The World Travel Awards reward the best travel and tourism organisations in the world. Etihad Airways has now taken home the top airline award for the past four years, a huge and well-deserved achievement. As the fastest growing airline in the history of commercial aviation, Etihad Airways has expanded rapidly as a global business yet at the same time has consistently elevated the customer experience. Congratulations to Etihad Airways on their continued success.” said World Travel Awards President, Mr Graham Cooke. 18 Jun 2015: Etihad is launching flights to Hong Kong today. The daily flights will be operated by a two-class Airbus A330. 06 Jan 2015: Etihad Airways’ two new aircraft, the Airbus A380-800 and the Boeing B787 Dreamliner, were launched in a glitzy event in Abu Dhabi a week ago. The massive A380 started flying between London and Abu Dhabi on the 5th of January 2015 on flight numbers EY11 and EY12 respectively. The airline plans to add a second A380 to this route in 2015. The Dreamliner will be used on their Düsseldorf route from the 1st of February 2015, with flights to Mumbai, Washington, Brisbane and Moscow to follow later in the year. 05 Jan 2015: Etihad Airways has had to deal with occasional heavy fog these past couple of weeks. They have had to suspend services twice already and this during peak travel season. In the latest incident, several passengers were stranded on the tarmac for 12 hours without food or drink services over the weekend. Etihad appologized to passengers and urged travellers who had not already made their way to Abu Dhabi to make other arrangemets for later travel. Their main concern was to get passengers already at the airport sorted. The delays might still affect flights today. 17 Nov 2014: The European Commission has approved Etihad's stake acquisition in Alitalia, the final hurdle for the acquistition to become official. The transaction will be complete before the end of the year. 29 October 2014: Etihad will lanch daily flights to Dallas from the 16th of April next year. Their 3 weekly flights that will take off from the 3rd of December 2014 must have been a huge succes! They will have 217 seats to fill in a combination of First, Business and Economy class on the Boeing 777-200LR. 25 Sep 2014: Etihad is expanding it's routes in Africa by adding daily flights between Abu Dhabi and Dar es Salaam, Tanzania from the 1st of December 2014. The 4 hour 40 min flight will depart at 08h20 from Abu Dhabi and return at 14h00. An A320 will carry 136 passengers spread across business and economy class between the UAE and Africa. 22 Sep 2014: For passenger safety Etihad and a few other airlines have cancelled flights to Sana'a, the capital of Yemen amidst renewed conflict between the Shiite rebels and Sunni militias. Etihad has cancelled these flights indefintely. All flights to the Sanaa airport has been suspended for a 24 hour period. 9 Sep 2014: Etihad Airways have announced that they will be adding a new daily flight between Abu Dhabi and Karachi from the 18th of November 2014. They currently have one flight a day operating on this route, the new flight will see them operate two daily flights between Abu Dhabi and Karachi. The flight will depart Abu Dhabi at 23:15, arriving in Karachi at 02:25, return flight will depart at 05:25 and arrive at Abu Dhabi at 07:00. The aircraft that will be used is an Airbus A320. The aircraft has 120 economy class and 16 business class seats. 25 Aug 2014: Etihad Airways’ schedule between Abu Dhabi and Johannesburg will be revised with changes to come into effect from the 26th of October 2014. The airline will be adding new departure times to and from Abu Dhabi and JNB. Here are the new flight routes and times: Flight-EY602 leave Abu Dhabi (AUH) at 02h00 and arrives at Johannesburg at 08h40 on Wed, Fri and Sun. Flight-EY601 leaves JNB at 09h55 and arrives in AUH at 20h15 on Wed, Fri and Sun. Flight-EY604 leaves AUH at 10h35 and arrives in JNB at 17h10 on Mon, Tues, Thurs, Sat. Fligh-EY603 leaves JNB for AUH at 20h30 arrives 06h40 on Mon, Tues, Thurs, Sat. The airline must be seeing great potential in the South African market which is great news for Business and Tourism in SA. 18 Aug 2014: Etihad Airways has started offering a chauffeur service to all premium class passengers who are travelling to and from OR Tambo in Johannesburg. This complimentary service was launched last week and it is already in effect. Passengers will be transported in executive sedans to and from any location that is within 100 kilometres from OR Tambo. Those passengers who would like to use this services must make a reservation at least 24 hours before their flight departs. If the mileage exceeds 100km, passengers will be charged, the amount must be paid to the driver. The service can be booked through any accredited travel agency or through the airline's website. 11 Aug 2014: Etihad announced several new routes that they will add from their Abu Dhabi base in the first half of 2015. These routes include daily flights to Madrid (Spain), Edinburg (Scotland), Kolkata (India) and Entebbe (Uganda). 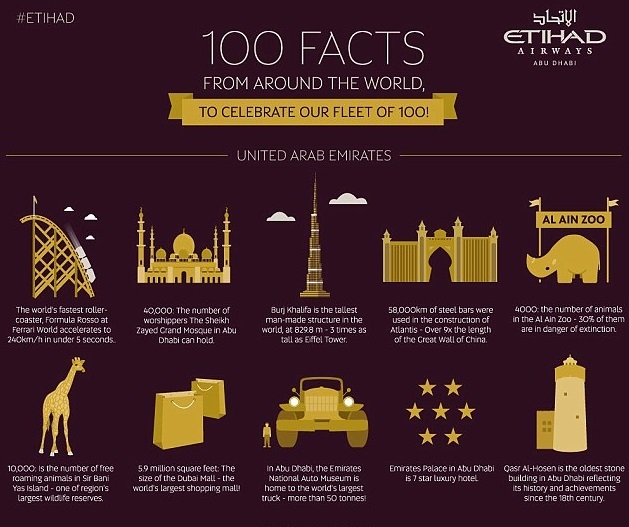 In celebration of the delivery of their 100th airplane, Etihad released an interesting infographic charting 100 of the most bizarre and random facts from around the world. Whilst we love it, we are wondering why they did not include South Africa? Find the full list here. 20 Dec 2013 Etihad launches a social media photo contest. Follow the airline on Twitter, Facebook or Instagram, post a photo with the hashtag #EyFollowYou, submit the details on Etihad's Facebook page, and you could win roundtrip tickets. 2013-11-04. Live News on Etihad Flights Etihad has begun showing live broadcasts of BBC Arabic, Euronews & BBC World News on its flights; and plans to add CNN, CNBC & NHK World Premium in November 2013. 2013-10-07. In the 3rd quarter of 2013 Etihad achieved load factors averaging 81%, an increase in passenger numbers of 11% to 3.1 million and an increase in revenue also of 11% to USD1.4bn. 2013-07-22. James Hogan Wins Award The President of Etihad, James Hogan, has won the award for Executive Leadership from the Airline Strategy Awards. 20 May 2013. Etihad has purchased Abu Dhabi Airport Services, Abu Dhabi In-Flight Catering & Abu Dhabi Cargo Company. 2 May 2013. Etihad joins with LinkedIn to produce Etihad Mapped Out, where you can search for your LinkedIn contacts by region. There's a navigable map, which indicates the number of contacts you have in each city. If you're flying to Cape Town, then search on "Cape Town" and it shows you all your contacts there. You can filter by first order/second order connections, as well as by industry. 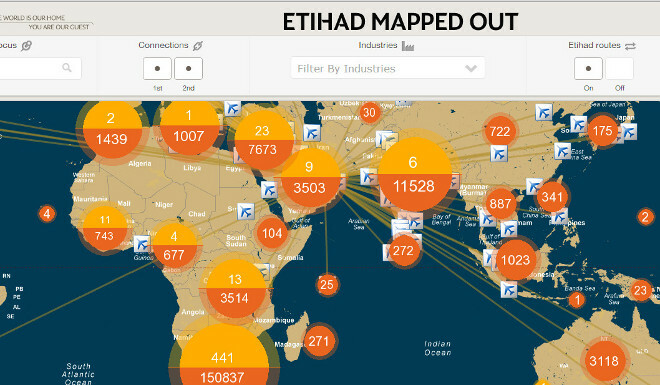 You can also decide whether you want to see Etihad's flight routes on the map. 7 Apr 2013. Etihad announces a record 2.8m passengers flown in the first quarter of 2013, an increase of 18% over Q1 2012. Etihad's Chief Exec, Mr J Hogan, says that "Our Q1 2013 results have again outstripped global trends, with our strongest ever first quarter results for passenger revenue. This performance demonstrates that Etihad Airways' strategy of organic growth, wide-ranging partnerships, and strategic equity investments is delivering for us and our partners." 1 Jan 2013. Etihad carried a record 10.29 million passengers in 2012, up on the 8.41 million pax in 2011. 26 Nov 2012 Etihad Business Class. If you travel on Etihad Pearl Business or Diamond First Class before 27 November 2012, you will receive triple miles on First Class and Double Miles on Business Class. Oct 2012 Etihad is offering double miles to Etihad Guest Members booking flights within 30 days of the launch of the new routes to Addis Ababa, Ahmedabad, Washington DC, Sao Paulo or Ho Chi Minh City. 30 Jun 2012 Etihad establishes new passenger records, averaging 31,700 passengers per day from 26 to 30 June 2012. "Etihad Airways continues to set records for passenger bookings and passenger numbers, and we expect this to continue throughout the northern hemisphere peak summer season in 2012. These record figures demonstrate that air travellers across global markets are consistently choosing to fly with Etihad Airways , whether for business or leisure trips, and to reach those numbers, for an airline that is still less than ten years old, is a remarkable achievement. The success of these record five passenger days, as well as management of on-going high volumes of traffic to and through our Abu Dhabi hub, has been due to excellent planning and coordination by the Etihad Airways operations team and colleagues from Abu Dhabi Airport Company, Abu Dhabi Airport Services, Abu Dhabi Airport Police, and Immigration." said the CEO of Etihad, James Hogan. June 2012 Etihad Airways purchases 200 hens and 3 beehives, to offer its first class passengers its own range of organic eggs & honey. 1 Feb 2012. Etihad offers complimentary 96-hour visas to passengers who book accommodation at the Radisson Blu Yas Island. 28 Sep 2010. Etihad Airways appoints Maurice Phohleli as new GM in South Africa. 18 May 2009. 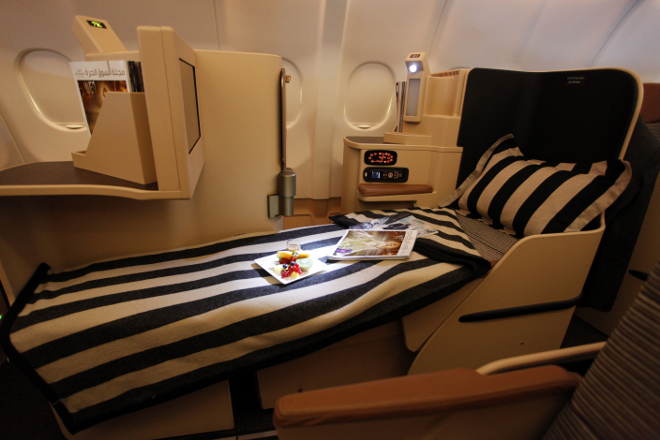 From the 18th May Etihad Abu Dhabi - Johannesburg flights will offer the option of their award-winning first class seats. 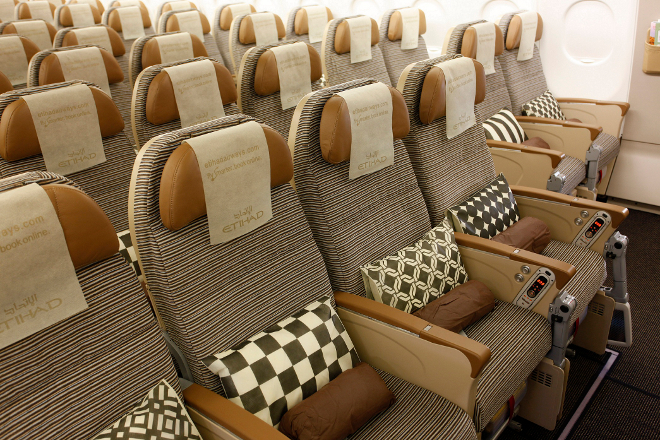 From the 28th March 2009 until the 15th May 2009 the first class service will be available on selected Etihad flights. Passengers can eat anytime they want. Etihad offers daily flights between Johannesburg & Abu Dhabi. South African passport holders do not require transit visas to go through Abu Dhabi airport. 13 Apr 2009. Etihad moves a number of its flights to its new passenger facility next to Terminal 1 at Abu Dhabi International Airport, meaning that Etihad now has flights departing from both Terminal one and Terminal three. Terminal 1 provides capacity for an extra 5 million passengers per year. Flights from Abu Dhabi to Johannesburg depart from Terminal 3. Amman, Beirut, Cairo, Casablanca, Chennai, Damascus, Dhaka, Islamabad, Karachi, Kathmandu, Khartoum, Kochi, Kozhikode, New York, Lahore, Peshawar, Tehran, Thiruvananthapuran. Almaty, Bahrain, Bangkok, Beijing, Brisbane, Brussels, Damman, Doha, Dublin, Jeddah, Frankfurt, Geneva, Jakarta, Johannesburg, Kuala Lumpur, Kuwait, London Heathrow, Manchester, Manila, Melbourne, Milan, Minsk, Moscow, Mumbai, Munich, Muscat, New Delhi, Paris, Riyadh, Singapore, Sydney, Toronto. 2013-08-26. It's reported that Etihad and Alitalia are in talks for a possible partnership deal. 25 Apr 2013. Etihad purchases 24% of Indian Airliner, Jet Airways for USD379m (Jet Airways used to fly the Johannesburg to Mumbai route - stopped on the 12th June 2012). 23 Dec 2012. Etihad acquires a majority stake in a new company which has been set up to own airberlin's topbonus frequent flyer program. "The acquisition of a stake in the new topbonus company is part of our strategic evolution to create a ‘house of brands’ loyalty management company, with global scale. The loyalty program sector is a faster growing and higher margin business than the airline industry. This new approach allows both our companies to reap greater rewards together, with opportunities to generate sustained profits from our loyalty programs. The new company also provides an attractive vehicle for other airlines looking to generate further revenues from the fast-growing loyalty management sector." said Etihad CEO, James Hogan. 5 Jun 2012. Etihad reveals that it has purchased 3.96% of Virgin Australia. 16 May 2012. Etihad Guest (Etihad's frequent flyer program) partners with Seychelles Plus (Air Seychelles' loyalty program). 2013-07-31. Etihad Meet & Greet Upgraded Etihad are now also offering their meet & greet services to departing pax & transiting pax. 2013-06-05. Etihad Meet & Greet Want to get a personal meeting when you land at Abu Dhabi Airport? At an initial fee of USD38 per person for the "silver package" a member of Etihad's staff will welcome you, help with collecting your luggage and move you swiftly through immigration (up to 5 pax per Etihad staff member). That not enough? Then buy the gold package for USD65 per person which has a personal porter who takes your luggage for you to your ride, and there's only one Etihad staff member per pax. Meet and greet services must be booked at least 48 hours before you fly. "We are always looking at ways to make flying with Etihad Airways easier and more enjoyable. Being met by a friendly face and helped with luggage and guided through immigration and customs makes the process a breeze. Our Meet and Greet service is further demonstration of our commitment to giving our guests a memorable experience, which is also in the tradition of our warm Arabian hospitality." said Etihad's COO, Peter Baumgartner. In late 2014 Etihad is expected to begin taking delivery of A380s, and fly them to London, New York, Melbourne and Sydney. 2013-07-25 Etihad has decided to upgrade the engines of its A320s from V2500 SelectOne to V2500 SelectTwo engines. "The V2500 engine has played an important role in our Airbus A320 type operations, and SelectTwo is the latest example of how IAE strives for new solutions that add value to our fleet, whilst making our fuel-burn more efficient." said James Hogan, CEO of Etihad. The 2-class would consist of economy & business classes. The 3-class would consist of economy, business and then either a premium economy or first class cabin. 30 Oct 2012. Two A330-200 planes are purchased for $418m. Mr James Hogan, the Chief Executive of Etihad, said that “The reliable and highly versatile Airbus A330-200 has been an integral part of our global passenger and cargo success. As our operations and network continue to grow in scale, we feel the A330-200 is the right fleet type to expand with.” The plane has a range of 14,000km. May 2012. Etihad cancels an order for 6 Airbus A350-1000s. 15 Nov 2007. An Airbus A340-600 due to be delivered to Etihad is crashed into a wall at the Airbus Factory at Toulouse Blagnac International Airport, France. Five people were injured and the aircraft was written off. "Etihad Guest" is the name of their frequent flyer program. Complimentary Gold Card If you're a gold tier member of another airline's frequent flyer program Etihad will, up to the 18th June 2013 and only for the first 500 applicants, give you a complimentary Etihad Guest Gold Card. Just email them a scanned copy of your miles statement, your gold card, and your Etihad Guest membership no. They'll also, for a limited period, give you double Guest Miles in business class and triple Etihad Guest Miles in First Class. T&Cs apply. Johannesburg: 0861-ETIHAD / 0861 384423 (if you're calling from within SA) or +27 11 343 9140 (if you're phoning from outside South Africa). Cape Town: Same numbers as for Johannesburg. Etihad call their economy class "Coral Class"
South African require a visa to enter the UAE. Citizens of the following countries are allowed to enter the UAE without a visa prior to arrival as long as they are carrying a valid passport that will not expire within six months of their arrival date: Australia; Andorra; Austria; Brunei; Belgium; Denmark; Finland; France; Germany; Greece; Hong Kong; Iceland; Ireland; Italy; Japan; Liechtenstein; Luxembourg; Malaysia; Monaco; Netherlands; New Zealand; Norway; Portugal; San Marino; Singapore; South Korea; Spain; Sweden; Switzerland; United Kingdom; United States of America; and The Vatican. Immigration officials may grant a tourist visa, which is valid for 30 days, on arrival at the port of entry. With Emirates, Qatar Airways and Turkish Airlines all offering flights in the region and flights from Johannesburg, Etihad is not short of competitors.